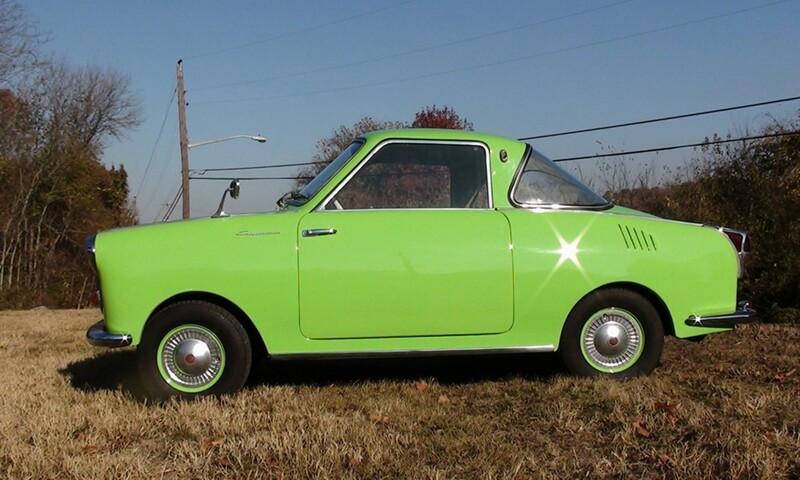 Does this look like another famous microcar to you? 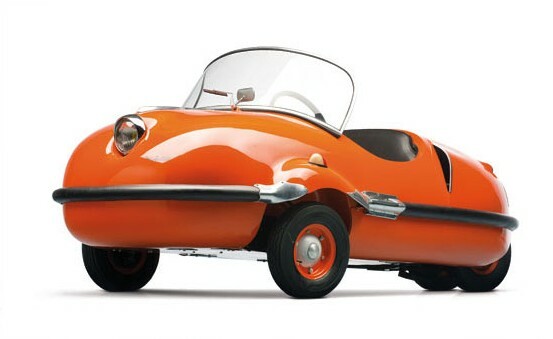 Specifically, the Goggomobil? Well, essentially, it is. Hans Glas (whose company ultimately became part of BMW) would start selling cars in 1955. 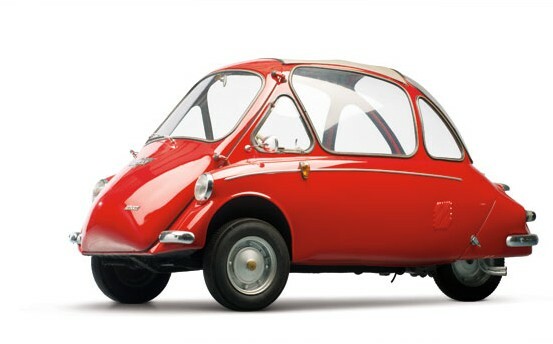 They were originally branded as “Goggomobil” – a marque that existed between 1955 and 1969. The Glas brand first appeared on a car in 1958. Here’s where it gets really interesting: between 1958 and 1965, Glas produced a car, larger than what you see here, called the Isar. 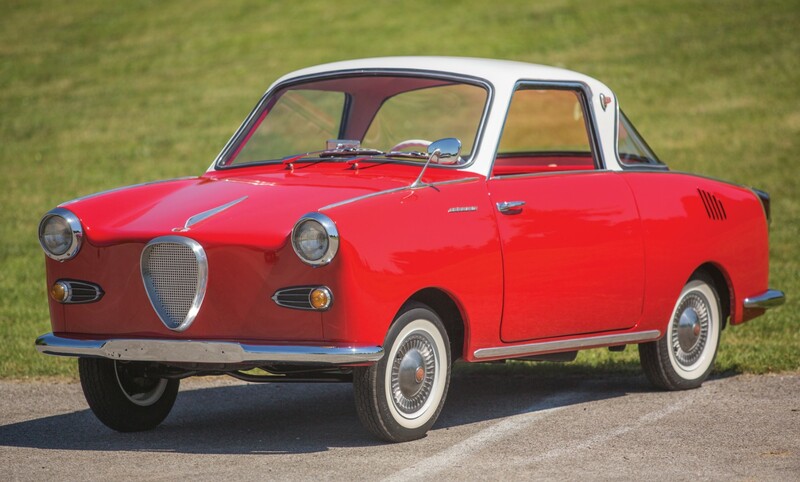 Then there is this, the Isard, with a “d.” The story is that “goggo” was negative French slang, so Glas had to sell the Goggomobil TS in France as the Glas Isard. So this is technically the same car as a Goggomobil TS400 but with a much more interesting backstory. It’s powered by a rear-engined 20 horsepower, 395cc straight-twin. For comparison, the car we featured yesterday had 800 more horsepower. Fun comes in all shapes and sizes – and in this case, it’s pint sized. Click here for more info and here for more from RM Sotheby’s. 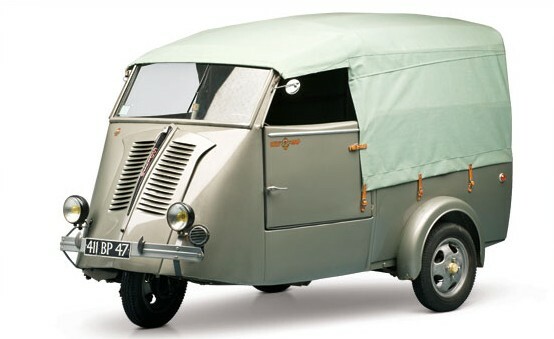 We’ve already featured the even-rarer pickup variant of the Goggomobil Transporter. This is the van version. It’s also a TL-250 model, which means it uses the smaller 245cc two-cylinder engine making 14 horsepower. These vans actually had a useful load-carrying capacity for their size and the German postal service used them – in fact, they were more or less responsible for their production, buying up about 2/3 of all vans built. This one (of 3,665 built) has been painted up in Double Bubble Gum colors. 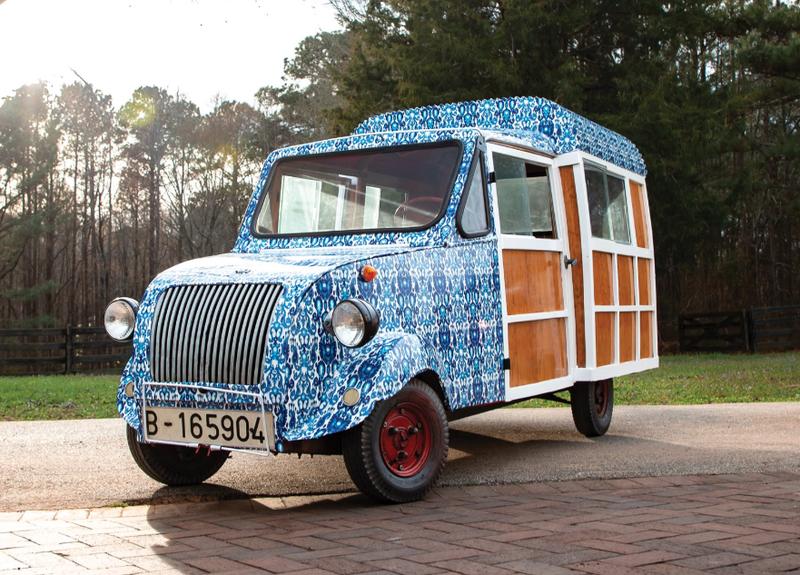 All of the Goggomobil Transporters in this sale have some “cute” paint scheme. The price isn’t as cute: $80,000-$100,000. click here for more info. This King S-7 was not manufactured by the same “King” company we talked about last week. This one was built in Sweden. The S-7 was originally built as a Fuldamobil in Germany but they were licensed all over and some licensed versions were exported. Sweden received some NWF cars but later they built there own S-7 version of the Fuldamobil and called it the Fram-King-Fulda. When that factory burned down, the assets were purchased and production restarted in 1958 or 1959 and it was called the King S-7. It was built until 1962 and 411 were made. It uses a 9.5 horsepower 191cc single-cylinder and should sell for between $35,000-$45,000. Click here for more info. 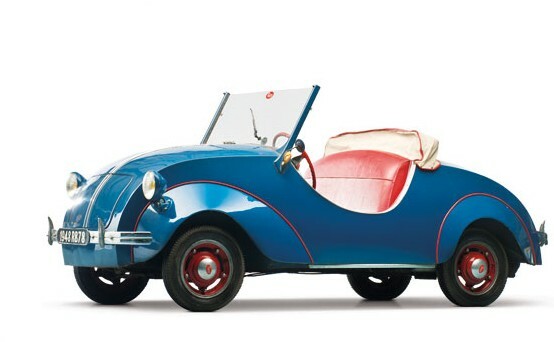 Egon Brütsch built a small two-seat convertible called the 200 or “Spatz.” He allowed prospective licensees to drive it and one, Harald Friedrich, liked it but realized Brütsch’s car was essentially crap. He hired an engineer to fix the issues with it and then put it into production under the name of a new company he formed, Bayerische Autowerke GmbH – or B.A.G. It was powered by the ubiquitous 9.5 horsepower 191cc single-cylinder Sachs motor that really got around in those days. Brütsch was not amused and threatened to take Friedrich to court (he eventually took the next group of people to court, and lost because the design was significantly improved over his original and therefore not an infringement) and Friedrich left the company – but not before 859 could be built and sold. This one should sell for between $30,000-$40,000. Click here for more info. Gabriel Voisin’s post-war fortunes were not quite as bright as those leading up to war. He designed the tiny Biscooter but, because he no longer controlled his own company, could not get it into production. In fact, no one wanted it – even though he racked up close to 1,000 orders for it. He sold the rights to the Spanish and moved on – sort of. At some point, he went back and designed another Biscooter, an enhanced version – the C31. Some things were different, but it was largely the same. The Spanish were not interested in this model (the one you see here). It uses a 197cc single-cylinder engine making nine horsepower. Still, 16 were built and this one should bring $60,000-$80,000. Click here for more info. If you weren’t aware, California was a weird place in the 1960s. Still is, really. But this was their idea of a car. 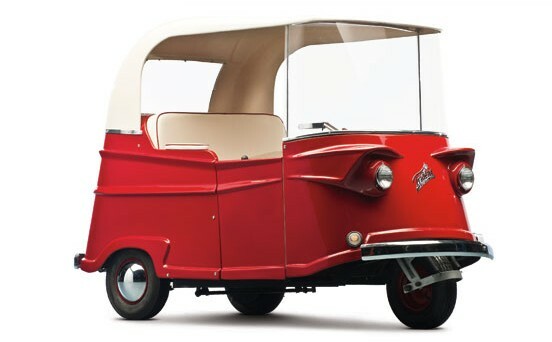 Originally introduced as a glorified grocery kart in 1955, the three-wheeled electric runabout was called the Taylor-Dunn PG. In 1959, the Trident was introduced. It still used a one horsepower electric motor – but it also had road-going capability. In today’s world of SUVs, you would need a death-wish to drive this down the street in suburban L.A. But 1961 was a different time – and you could always just hop up onto the sidewalk to get away from traffic – no one would be able to tell where you belonged anyway. This should sell for between $15,000-$20,000. Click here for more info. Hard work pays off – the brothers Rovin showed their first cyclecar in 1927 and when France was occupied during the war, the continued to work and design on a new car, knowing that the war and its restrictions would eventually end. They had a prototype done in 1945 and were ready to go once France began to get back on its feet. The production version was called the D2 and it uses a 10 horsepower 425cc two-cylinder engine. Their products were quality and they were able to stick around for a while – until about 1959, producing different models. The D2 was short-lived and only 200 were made. This one should bring between $30,000-$40,000. Click here for more info. This rough-looking tiny car was one of two prototypes built by Établissements Manom in Saint Ouen, France between 1952 and 1953. 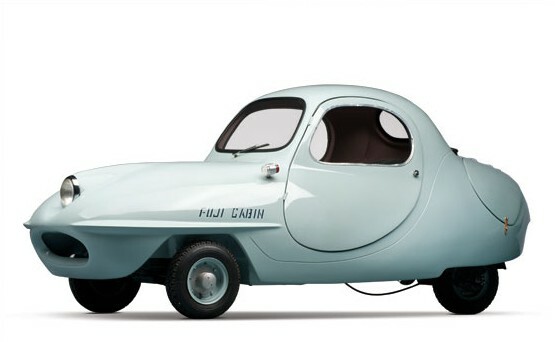 It uses a four horsepower 125cc single-cylinder and was supposed to set the microcar world on fire due to its ease of access and “roomy” interior. Needless to say, this was as far as the project got. It’s all-original and should sell for between $5,000-$10,000. Click here for more info. New-Map, the motorcycle manufacturer (who also built a few cars called the “Baby”), shifted focus to small three-wheeled commercial delivery vehicles in the late-1950s. They were sold under the “Solyto” name. 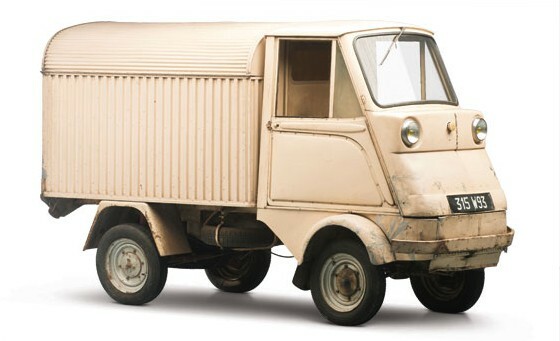 What separated them from their competitors is the two-seat closed cab design that gives it a more car-like appearance than the obviously-scooter-based Vespa delivery trucks and the like. This one uses a 125cc single-cylinder making 4.5 horsepower. These were also sold under license in Spain as the Delfín. This one should sell for between $15,000-$20,000. Click here for more info. 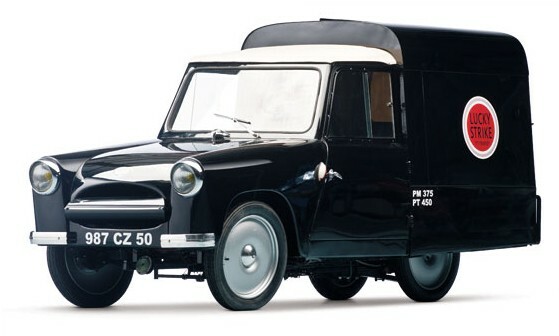 Another mini commercial vehicle to round out our second-to-last edition of Microcar Mondays. This has everything a big truck would have – except smaller – even a spare tire underneath. Motobécane was a major motorcycle and bicycle manufacturer in France from 1923 until 1981. 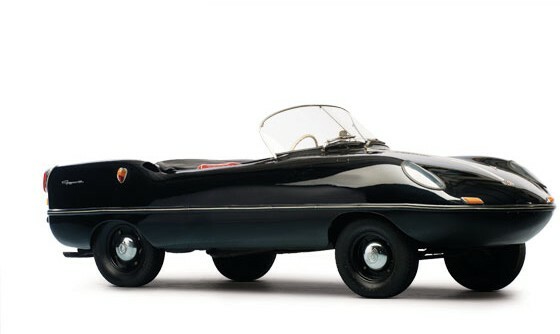 In 1962, they introduced a small car prototype called the KM 2 that never made it to production. There was also a utility version produced (KM 2U) – a lone prototype example. It is believed that this is that truck. It uses a 125cc single-cylinder engine making six horsepower. This unrestored mini-truck should sell for between $5,000-$10,000. Click here for more info. 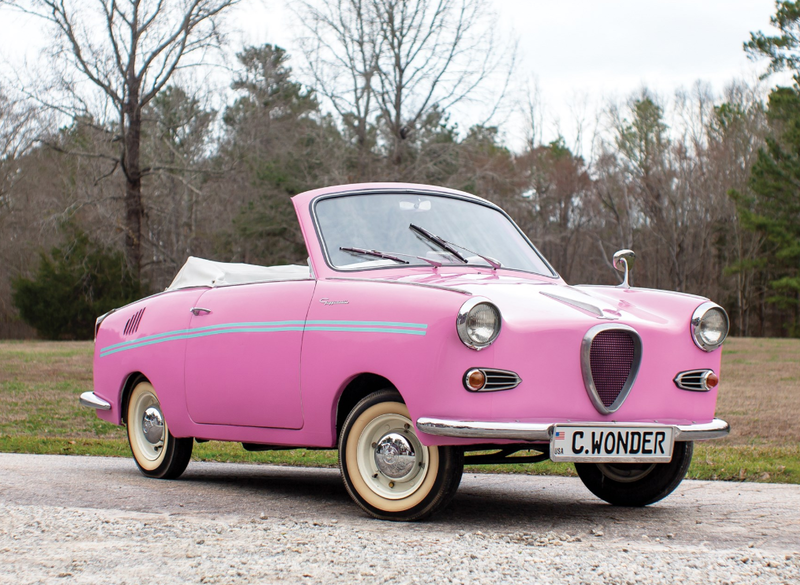 And click here to check out more microcars. Reyonnah (which comes from the name of company founder Robert Hannoyer spelled backwards), was a short-lived automaker from Paris. It was only around from 1951 through 1954 and this was the car that they built. A single-cylinder engine was used, either of the 125cc or 175cc variety. The 175cc put out 8.5 horsepower. It will do 63 mph and can seat two people – the passenger directly behind the driver. You’ll probably notice the weird angle this thing is parked at – that’s because the front had a very wide track compared to the rear – but, when parked, the front wheels could be brought in closer – to make it easier to park. When this happens, it raises the front of the car up into the air. Weird. This should sell for between $75,000-$100,000. Click here for more info. Most of the cars from this sale are from the 1940s through the 1960s. Not this one. 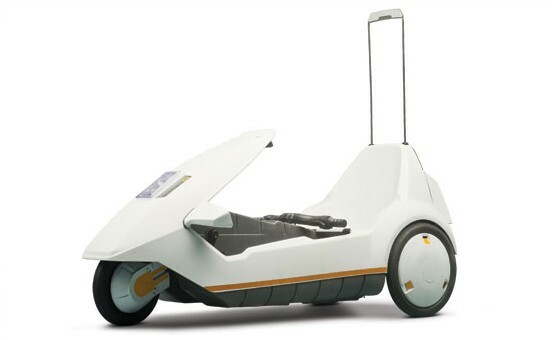 Designed by Sir Clive Sinclair and built by the Hoover vacuum people, the C5 was built for 1985 only. It had pedals (like a sit-down bicycle) but was also powered by an electric motor making capable of 15 mph. But a street-legal 15 mph tricycle – that could be driven without a driver’s license – was dangerous. And the fact that it was built and marketed primarily in England and had no top, made it unsuitable for the general climate. It was a massive flop, even though 17,000 were sold in 1985. It should sell for between $3,000-$5,000. Click here for more info. Wait, just a plain ol’ Mini Cooper after all these weird cars? Well, kind of. It isn’t a Morris or Austin or even a Mini-badged Cooper. It’s not even British-built. 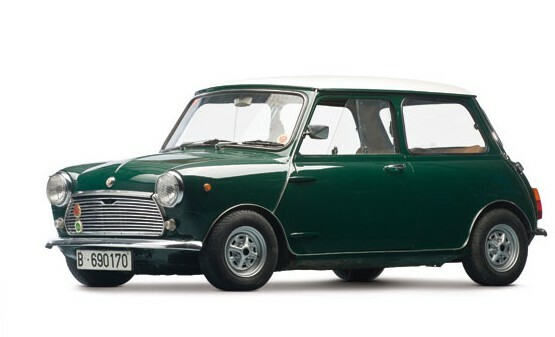 Authi – of Pamplona, Spain, – built the Mini under license from 1968 through 1975. This is from their first year of production and it has the 1275cc Mini engine (1.3 liters) making about 54 horsepower. Authi was an automotive production plant, primarily, and built cars for BMC under the Austin brand. But the Mini they branded themselves. The Authi plant became part of SEAT in 1976. They built about 140,000 Minis with their name on it, but you hardly ever see them. This one should sell for between $20,000-$30,000. Click here for more info. Another Isetta from another brand. 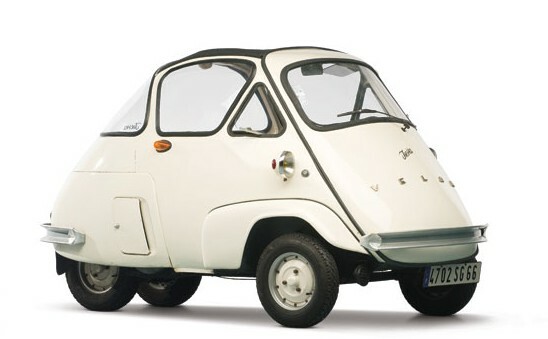 In this case, this Isetta was built by VELAM – a French company that built them under license between 1955 and 1958. There were slight variations – the body was more rounded and there is a big, bold “VELAM” script across the front door. It uses a 236cc split-single-cylinder engine making about 9.5 horsepower. It could do 50 mph and only about 5,000 were built. It should bring between $30,000-$40,000. Click here for more info. 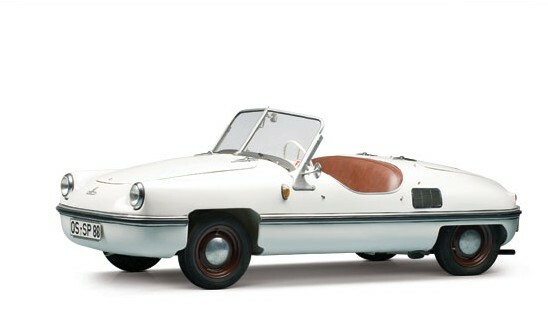 The Mark F iteration of the Bond Minicar was the second-to-last version offered for sale. Built from 1958-1963, the Mk F is differentiated from its immediate predecessor by its larger engine – a 247cc single-cylinder making 12 horsepower. There were different body styles offered – this is a hardtop. It was capable of 55 mph and there was a four-seat version available (I honestly can’t tell if this has four seats or two). Only 6,493 were made in total. This one, with some of the tiniest looking wheels in comparison to overall car size I’ve ever seen, should sell for somewhere in the range of $15,000-$20,000. Click here for more info. The Frisky was one of those cars that was produced by multiple companies – all of whom couldn’t help but go bankrupt at some point. The second company to use the Frisky trademark was Frisky Cars Ltd and they introduced the Family Three in late 1958. 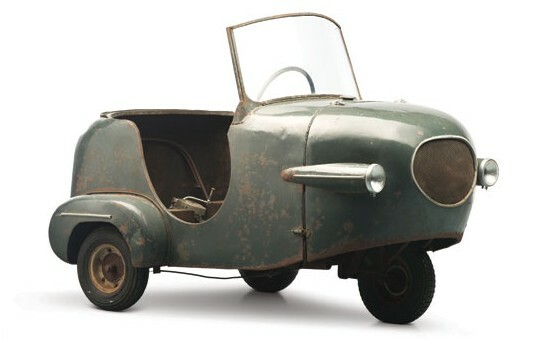 It was essentially a three-wheeled version of the Frisky Coupe that could be driven with a motorcycle license. The company was reorganized the following year (1959) and the model names were changed. This car uses a rear/mid-mounted 197cc single-cylinder making 9.5 horsepower. It could do 50 mph and should sell for between $15,000-$20,000. Click here for more info. PTV sold their Spanish-built microcars from 1956-1961. Two models were offered, the 250 and the 400. Both were tiny two-door convertibles that differed only in engine size. The 250 used a rear-mounted 247cc single-cylinder making 11 horsepower. Top speed was around 45 mph. Most of the cars were sold in Spain, although same made it to Portugal. Between the two models, a total of around 11,000 were sold. This one will sell again for between $40,000-$50,000. Click here for more info. 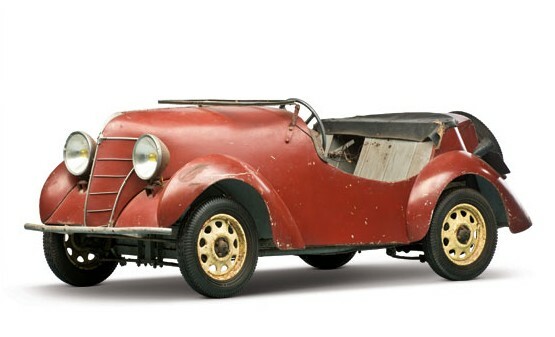 This unrestored pre-war microcar from French motorcycle manufacturer New-Map is very rare. 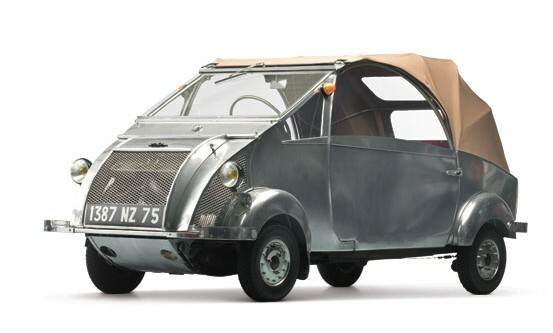 New-Map was founded in 1920 in Lyon and it built its first itty-bitty car in 1938. It was called the Baby and it used a 100cc single-cylinder Sachs engine – the same one from their motorcycles. Only about 1,000 were built. 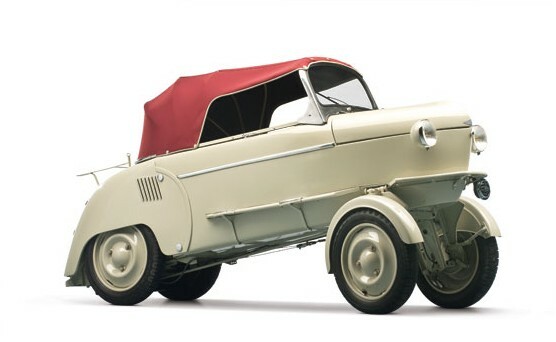 In 1946 they re-introduced the car with a 125cc engine but it only lasted one year. This one should bring between $15,000-$20,000. Click here for more info. 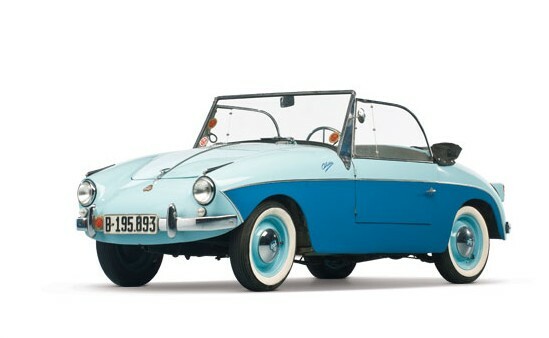 This little German fiberglass convertible was originally marketed as the Brütsch Spatz. Victoria was a motorcycle manufacturer in Nuremberg and they entered a joint venture with another company to form BAG (Bayerische Autowerke GmbH), to produce these cars under license as the BAG Spatz. But first, they re-engineered the car to make it stronger and safer – and added a fourth wheel from the original three-wheeled design – this got them out of paying licensing fees. Lastly, they pumped the displacement up to 250cc from 200cc. The single-cylinder made 14 horsepower. While BAG produced the Spatz, Victoria produced the car concurrently, from 1956 through 1958 as the Victoria 250. Only 729 of the Victoria-badged cars were sold. This one should sell for between $35,000-$45,000. Click here for more info. 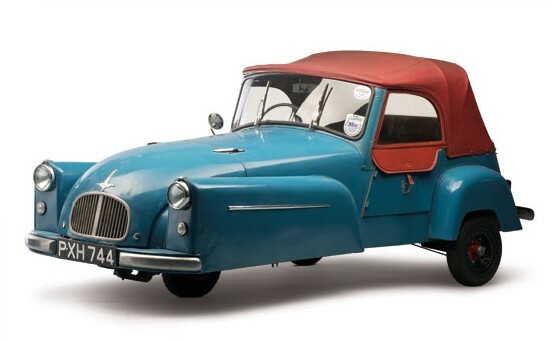 Goggomobil was a German microcar company, but in 1959, Buckle Motors of Sydney, Australia designed a two-door roadster based on the small Goggomobil Coupe. Somehow, they were able to market the cars under the Goggomobil name and they called it the Dart. It used the same 293cc straight-two making 14 horsepower (with an optional upgrade to 392cc and 18 horsepower). The body was fiberglass and it was produced through 1961. Only about 700 were built. It’s an Australian car with a German name and it could be yours for $35,000-$45,000. Click here for more info. The Trojan 200 was a British-built licensed copy of the Heinkel Kabine. The Kabine went out of production in Germany in 1958 and Trojan production didn’t start until 1960 (and lasted through 1966). It uses a 198cc single-cylinder engine making 10 horsepower (if you round up) and it can do 56 mph. 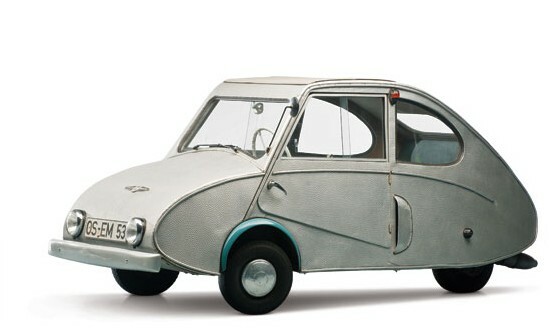 People might mistake it for an Isetta, which it isn’t, it just happens to have a front-opening door. It should sell for between $30,000-$40,000. Click here for more info. 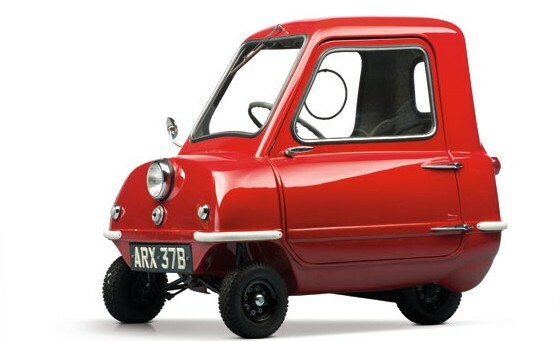 The Peel P50 is the smallest closed-roof microcar you’re likely to find. It was advertised as having enough room for one adult and one shopping bag. Jeremy Clarkson on Top Gear drove one of these through the hallways of the BBC offices. He didn’t so much ride in it as he did wear it. Parked next to an Isetta, the Isetta looks giant. Clarkson also called it “almost cheaper than walking.” It’s powered by a 49cc single-cylinder engine making 4.2 horsepower. It could do 38 mph and only 50 were built, 27 of which still survive. The car re-entered production in 2011, for whatever unnecessary reason. This original example should sell for between $35,000-$45,000. Click here for more info. This Mochet CM-125Y commercial vehicle is about the right size for transporting cigarettes – so I think the Lucky Strike scheme works well. You aren’t going to fit a Lay-Z-Boy in the back of this thing. It is powered by a 125cc single-cylinder making five horsepower, so it probably would struggle to haul said Lay-Z-Boy. Mochet built a number of different models, but total production was only around 3,000. There are three of these CM-125Y commercial vans in the U.S. and this one should bring between $35,000-$45,000. Click here for more info. 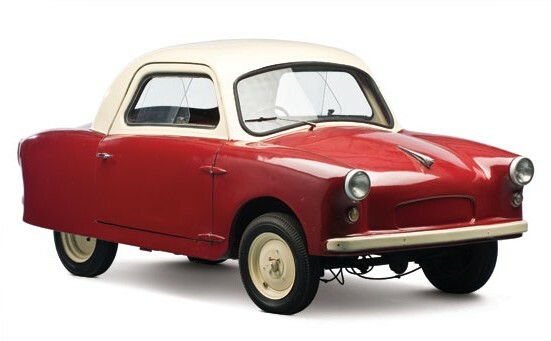 Goggomobil was the rare microcar manufacturer that actually hit big time production, with total output in the hundreds of thousands. 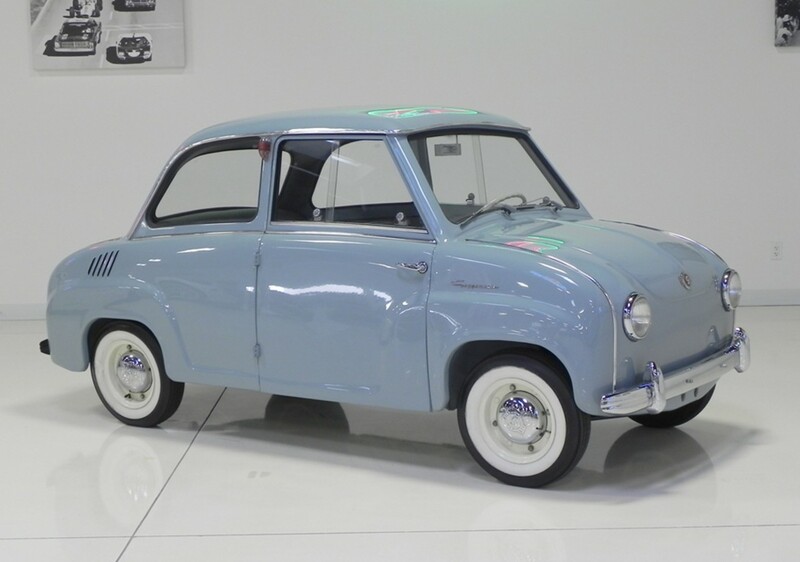 This had a lot to do with the fact that Goggomobil was owned by Glas, an established automotive company. But not every model was lucky to sell multitudes. 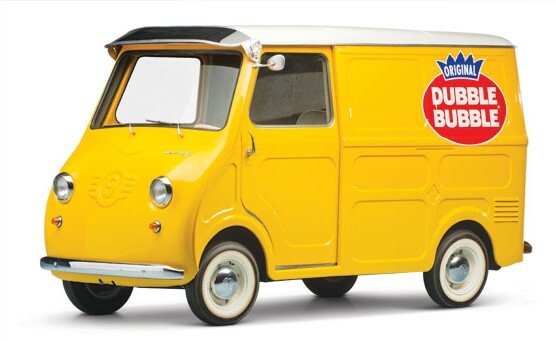 The TL Transporter model, which was produced at the request of the German postal service, was made from 1958 through 1965. Only 3,667 were built – including both van and pickup bodystyles. There were various engines available but this one uses a 398cc making about 18 horsepower. 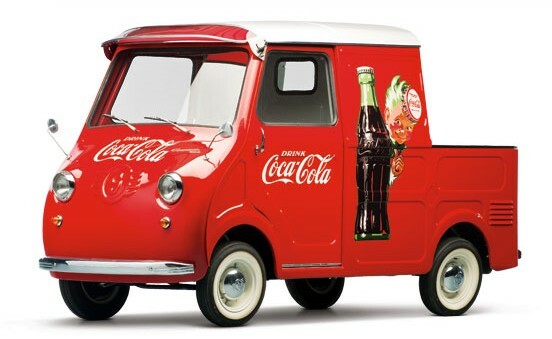 It’s painted in Coca-Cola colors, ensuring a wide market appeal for potential buyers. Coca-Cola memorabilia sells – and cute sells too. Both help explain the pre-sale estimate of $100,000-$125,000. For more information, click here. The Avolette Record Deluxe was a French license-built version of the Brütsch Zwerg. Zwerg? Zwerg. Most Avolettes were three-wheelers, but you can see this one has four. It has a single-cylinder engine of 250cc making 14 horsepower. In production for only two years, the Record Deluxe didn’t rack up record sales numbers – only about 30 were produced. This one should sell for between $45,000-$55,000. Click here for more info. 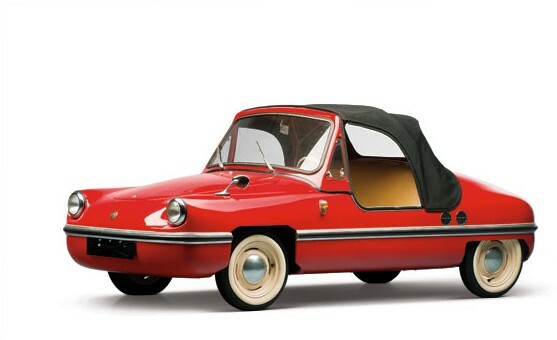 Fuldamobil started producing cars in 1950 and lasted through 1969. They didn’t build a lot of cars, but their designs were licensed to other manufacturers throughout Europe. The N2 is an unusual, very rare and not very well known model from the company. Produced from 1952 through 1955, it used a 359cc single-cylinder making nine horsepower. The body is bare aluminium over a wood frame and looks very strange and simple. Only 380 were built. This one should sell for between $40,000-$50,000. Click here for more info. Renzo Rivolta, whose company Iso was producing refrigerators and scooters in the 1950s, wanted to make a small car that could sell across a wide market. 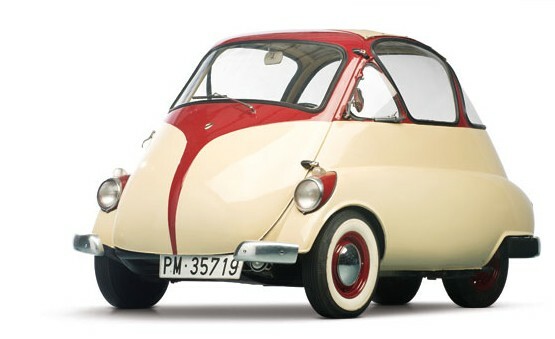 Two of his engineers designed this, and called it the Isetta. It used a front-hinged door and a 9.5 horsepower 236cc split-single two-stroke engine. Top speed was 47 mph but the design caught on and when Rivolta wanted to focus on sports cars, he licensed the design out to multiple companies all over the world. Produced from 1953 until 1955, only about 1,000 were built. But it was the first. This one should sell for between $30,000-$40,000. Click here for more info. The Fend Flitzer was an invalid carriage designed by Fritz Fend (tongue twister!). 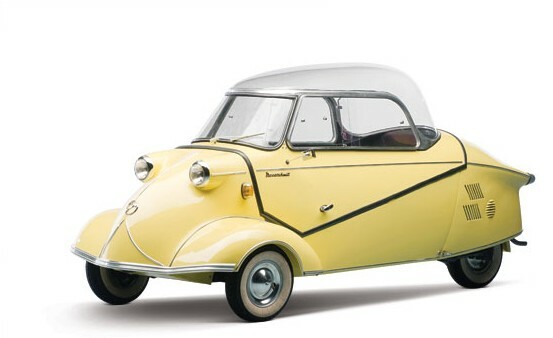 After World War II, German aircraft companies were banned from producing aircraft, and Messerschmitt had nothing else going on – so when Fend approached them to put his Flitzer-based bubble car into production, they went for it and the Messerschmitt Kabinenroller was born. The KR 200 was in production from 1956 through 1964 and approximately 40,000 were built – about half of which appear to be in this auction. Seating is tandem – the passenger behind the driver. The engine is a 10 horsepower single-cylinder of 191cc. It could do 65 mph. This one should sell for between $40,000-$50,000. Click here for more info. 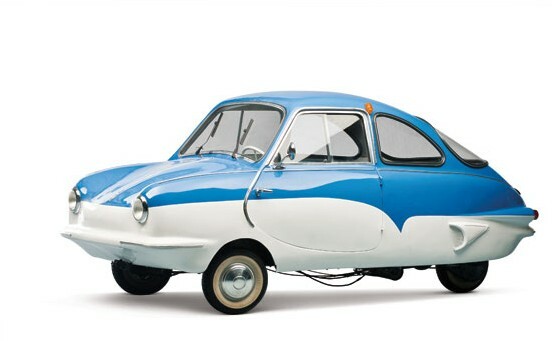 The Opperman Unicar was inspired by the series of Bond Minicars. When the owner of the Opperman tractor company saw a Bond, he decided to build his own automobile. 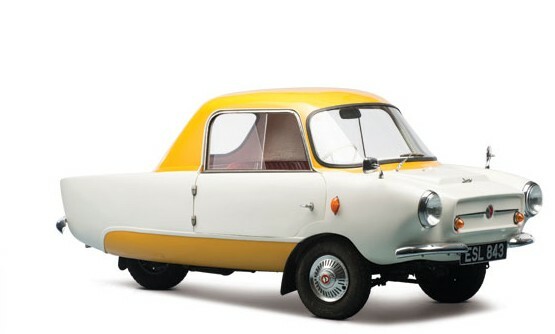 The Unicar was actually designed by Lawrie Bond and was in production from 1956 through 1959. 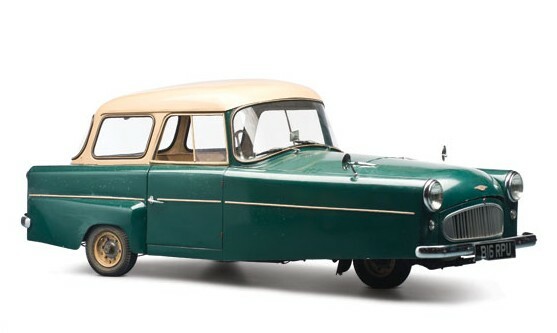 It was the cheapest car you could buy in the U.K. in 1956 and was even available as a kit. The only opening parts are the doors and it is powered by an 18 horsepower 328cc two-cylinder engine. It’ll do 45 mph and only about 200 were built. This one should sell for between $15,000-$20,000. Click here for more info.